When you successfully log in to your new account from the main WordPress home page, WordPress returns you to the main WordPress website, but this time you see a slightly different display on the home page — the navigation menu is at the top. 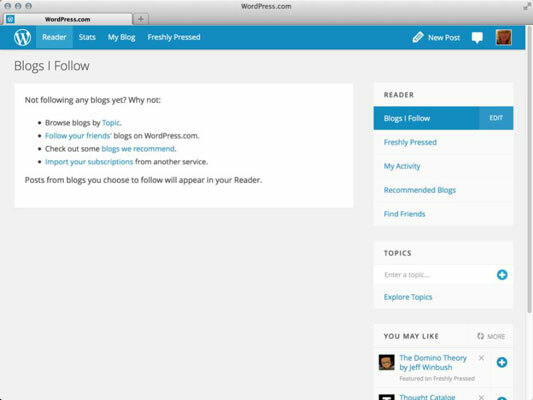 Reader: Click this tab to discover new posts and updates from the WordPress.com blogs that you follow. Stats: Click this tab to view the statistics of your WordPress blog in graphical format. At a glance, discover how many people are visiting your blog and where they are coming from. My Blog: This tab displays quick-access links to blogs that you own within the WordPress network. Freshly Pressed: Click this tab and discover the latest posts from bloggers within the WordPress.com network. New Post: Click this tab to write and publish a post on your WordPress blog. The WordPress Dashboard has the full post interface; however, this part of the WordPress home page provides you with a quick way to publish a quick post. Notifications: When you click this icon, you find updates from blogs that you subscribe to in the WordPress.com network, as well as discussions and comments that you subscribe to. Quick access links to important areas of your WordPress Dashboard appear after you log in to your WordPress account. You see your photo at the very top of your browser window, on the right side. This photo also appears at the top of any WordPress blog you surf to as long as you’re logged in to your WordPress account. This menu bar consists of several helpful quick links for you to access your account, your Dashboard, and various options. Your Blog: Click this to visit the Dashboard of your blog, where you can publish and manage all aspects of your blog(s) in the WordPress.com network. Settings: Click this to visit Account Settings, where you can edit your own user profile, password, e-mail address, and applications (or third-party applications such as Twitter or Facebook). Find Friends: Click this link to visit the Find Friends page, where you can locate your friends in other networks such as Twitter, Facebook, and Google+. You can also find friends and/or blogs within the network by using the Recommended Blogs link, or you can explore the topics to find blogs of interest to you. Help & Support: Click this link to visit the support area of WordPress.com, where you can find helpful articles and tutorials on using your WordPress account.